The medley of all mighty ducks snapback medleys. Auctions running on mighty ducks snapbacks from 99 cents, no reserve. Since Disney still own the image rights to The Mighty Ducks, the team remain the only popular franchise who’s merchandise cannot be re-created under normal NHL licensing laws. 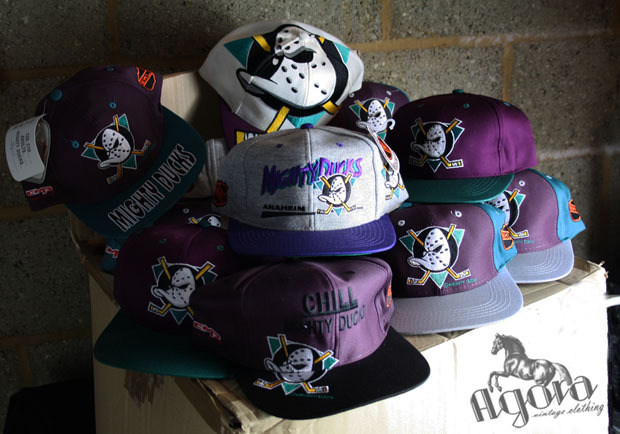 Therefore if you see a Mighty Ducks snapback it is always a vintage one. That’s why they are generally the most expensive pieces on the market. That said, there are lots of fake Mighty Ducks snapbacks on the circuit right now. The colors are off, and they don’t have proper tags. Forget about those. This entry was posted in anaheim mighty ducks snapback, deadstock, mighty ducks, snapbacks, the game big logo snapback, vintage snapbacks on November 5, 2011 by agora.